CLICK BUY NOW to purchase this special deal. Its SAFE & easy! All major cards accepted or use your paypal account. 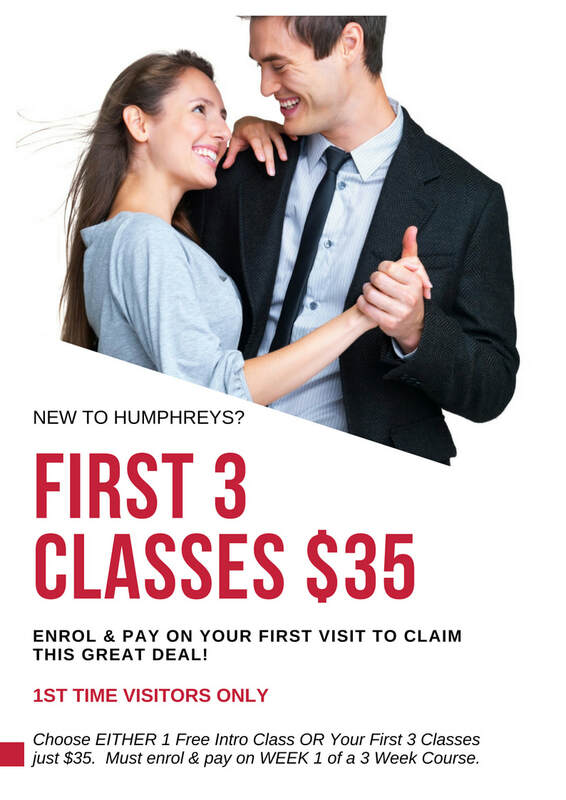 ​*You can choose EITHER 1 Free Introductory Class for your first visit to Humphreys OR you may purchase your first 3 classes at the discounted priced of $35 (save $31). To claim your First 3 Classes at just $35 you must enrol and pay in advance or during your first visit. This discounted price is only available to first time students and may only be redeemed at the beginning of a 3 week class cycle. See our timetable and complete the form above or send an email to register and book or for more information. Free Intro Voucher or discount price valid for first time visitors to Humphreys Dance Studio only. Voucher or discount deal is valid for Social Ballroom & Latin Classes & New Vogue Classes. Voucher or discount deal is not valid for dance courses such as Salsa, West Coast Swing or Medal Courses. Just drop us a line with your questions.